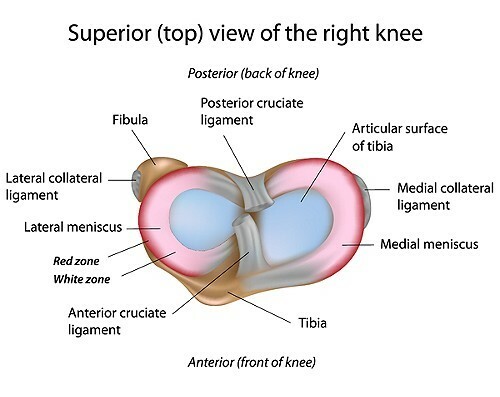 The knee joint is surrounded by connective tissue known as the lateral meniscus and the medial meniscus. Located between the tibia bone and the femur, these hemispherical-shaped cartilages function to prevent knee joint damage and normal or rapid wear, protect the area from injury, and deter the negative effects of shock. The injury of the medial meniscus is more common than the other. Besides protecting the knee joint, the two menisci create a cup shape for the femur to rest. They fill the gap in between the femur and the tibia bone. Their inner surfaces are somewhat thin, but their outer edges are thick. If the crescent moon shaped cartilage was not there, the two bones would not interact well at all as the end of one is curved and the other flat. Located on the outside section of the knee, the lateral meniscus is the more round of the two menisci. It is more moveable than the other one as it is not attached to a knee joint capsule or ligament. Although rare, lateral meniscus tear can occur. The medial meniscus is longer, but still is crescent shaped. It is bigger in size due to its proximity to the tibia. Because it is located on the inside section of the knee and is attached to the joint capsule and a ligament, it is more susceptible to injury. Menisci need to be resilient and flexible, but strong at the same time. They have limited blood flow because of the fibrocartilage they are composed of. Because of this, it takes them longer to heal and sometimes never do completely. Swelling and extreme pain typically happens within 24 hours of the injury. You may have limited mobility, including difficulty walking and moving of the knee. Your knee may become locked if a piece of cartilage becomes lodged in the joint. Pain when putting pressure on your knee, especially along the joint line and meniscus. With repeated activity, the tear will often worsen as well as the pain. Knee pain when you try to extend your leg. Tightness, swelling and stiffness of the knee. 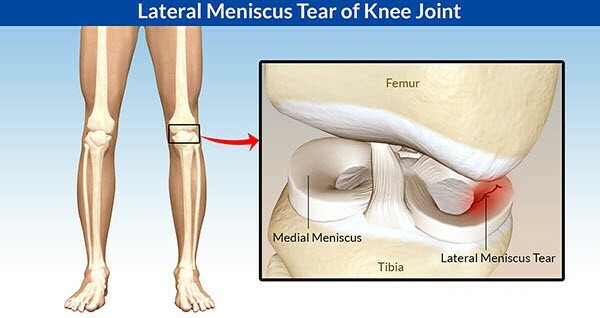 The tear can happen with time as the meniscus becomes less resilient. It can also happen when your foot is fixed firmly on the ground and your knee is twisted unexpectedly by a sudden motion. When you think you have injured your menisci, you should see your doctor as soon as possible. You will be asked questions like how you hurt your knee, if you’ve suffered other knee injuries, and symptoms you have experienced since your knee was injured. Since the medial meniscus is injured more often, a special test is available. This test is known as the McMurray’s test: This test is performed by holding the knee in one hand by the joint line and flexing it to full capacity, while the other hand holds the sole of your foot. Your doctor will then put stress on the knee by pushing it laterally from the medial side. While still holding the knee, the other hand will rotate your leg in an internal motion while the knee is still extended. If you feel a click or experience pain, the test is positive for a lateral meniscus tear. Often, a doctor may want more tests done because other knee conditions can cause the same symptoms. Imaging tests assist in a more accurate diagnosis. X-rays: X-rays cannot directly pinpoint tears of the meniscus but they can rule out or identify other causes of your knee discomfort or pain. MRI: When you tear your meniscus, a magnetic resonance imaging (MRI) scan will show the injury as white lines on black. While this test will show a tear up to 90% of the time, it does not always. If a meniscus tear shows up on a MRI, it is considered a Grade 3. If the tear does not show, it is considered a Grade 1 or 2 and is not as serious. When you experience a medial or lateral meniscus tear, your treatment options will depend on the severity, location and size of the tear. When a tear is on the outer section of a meniscus and if it is small in nature, you may not need surgery. As long as you have a stable knee or your symptoms are not persistent, you can try other treatment options. Often, pain medication can keep your symptoms under control while you go through physical therapy to gradually heal your injury. R.I.C.E. (rest, ice, compression, elevation) is often an effective course of action for sports injuries. Grade 1 or 2 tears are typically treated this way. Arthroscopic repair: An arthroscope is basically an endoscope that reaches the knee joint when inserted through a small incision. This allows the surgeon to see the tear and its severity. Dart-like repair pieces are inserted and then put across the tear. They “pull” the injury together so that it can heal back into one piece. Overtime, the dart pieces are absorbed into your system. The surgery is an in and out procedure taking less than 40 minutes to complete. Meniscus repair: Occasionally a meniscus tear can be stitched back together. Recovery time is lengthy because the area needs sufficient time to heal. Arthroscopic partial meniscectomy: In order to give your knee normal function capability, this procedure is designed to remove the obstructing piece of the torn meniscus. Arthroscopic total meniscectomy: Sometimes a large tear requires the entire meniscus to be surgically removed because it cannot be repaired. If you are required to have surgery, your knee may be put in a brace or cast to keep it immobile. This will allow the meniscus time to heal. You will also have to use crutches to move about in order to keep the weight off the injury for approximately a month. After enough time has passed for sufficient healing, you will be prescribed rehabilitation or physical therapy exercises. These exercises are designed to build up strength in your knee and help you regain mobility. Depending on which type of surgery you received, your rehabilitation time can range from a couple of weeks to a few months.